Should we make one for IE? 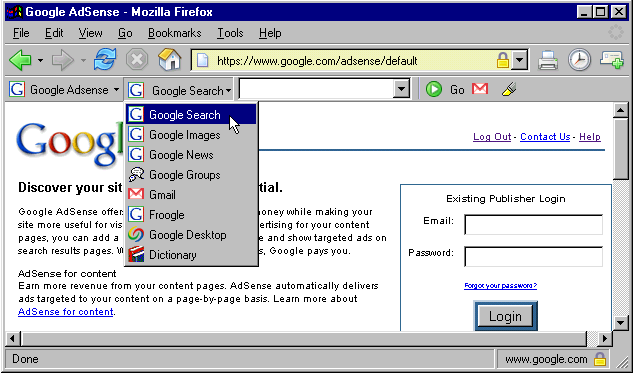 Click it, and select "allow" Now you can install the Google Firefox toolbar. 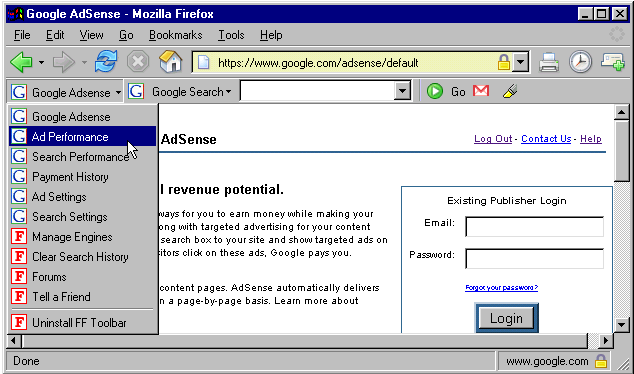 The Google-Adsense Firefox UltraBar works on Macs and Windows. It gives you direct links to areas of your Adsense account. It also allows you to search all of the Google Search engines, including Gmail and the new Google Desktop Search. --No Spyware, adware or other garbage...but you don't have to take our word for it. The nature of XUL, which is what our copyright code is written in, allows for you to see that there is no 'bad guy' stuff in the bar. --Direct, one click access to "Gmail"
If you have any questions about the Google-Adsense Firefox UltraBar, or you are having problems installing it, please send us an email. We will respond as quickly as possible.